In August 1973, armed criminals entered a bank in Stockholm, Sweden taking four hostages, three women and one man holding them for six days. By the end of their ordeal, the hostages had surprisingly formed some sort of bond with their captors defending their behaviour to the police. One later got engaged to one of their captors. Another paid towards the legal fees of one of the hostage takers. Subsequently, this unhealthy attachment between a victim and their captors or abusers became known as Stockholm Syndrome or Trauma Bonding. Patrick Carnes, author of The Betrayal Bond, has stated that all of these relationships share one thing, they are situations of incredible intensity or importance where there is an exploitation of trust or power. The vast majority of people who become involved with a narcissistic personality talk about their initial feelings of having met their soulmate. The intensity of the relationship produces feelings that may not have been experienced in other relationships. During this initial stage, strong emotional bonds are formed. This misplaced loyalty is always associated with some sort of danger or risk. This unhealthy attachment is strangely the norm as opposed to the exception. These bonds are difficult to break and tend to become stronger over time. 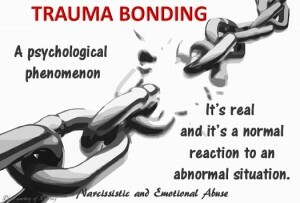 When it comes to severing ties with an abusive personality, the bonds may appear to be unbreakable. The bad behaviour and the lies become acceptable. The victim longs for a continued connection with someone who they know will cause them more pain. They find themselves wanting to be understood by someone who clearly doesn’t care. They hold onto secrets and trust people time and time again who have long since proved themselves to be untrustworthy. Do not make or receive phone calls. (If they ring you from an unknown number, hang up when you hear their voice). Do not respond to emails. Block them on social media. Avoid looking at photographs. (Looking at photographs will keep their memory alive in your mind. It is like opening a wound and not letting it knit together and heal. Close that photo album for the time being). Do not snoop on Facebook or other social media. (You don’t need to know what they are doing or who they are doing it with). If you pass them on the street, look the other way. If they leave you an email, don’t read it. Avoid going to places where you might run into them. If you happen to work with them, keep to the rules when and where possible. Keep communication on a business level only. Some may find it necessary to seek help and support from therapists and / or self help groups in order to detach completely. I have nothing. I’m so lost. Thank you… great read ! You may not have found her so attractive if she hadn’t chosen you. Your days were numbered before you knew it. Second, I don’t think these people are “blind to the pain” that the inflict. I believe it is very intentional. Good luck with your recovery. I believe so. Sometimes short term. My ex saw me from across a room at a private veterans club. He told his group that he didn’t know who I was but he was going to marry me. I look back and goodness I was a mixed up kid who knew almost nothing about psychology. I wish I could go back with what I know now. Omg that’s how I met my ex!! He said the exact same thing to his friends!! The love boming was epic…and the freaky control behavior started immediately after he moved in. He was a narcissist. i did not know that people like this exist. we were the perfect match so I thought. I was going to be the answer and care for him as no one else was… before I knew it there were the threats, the circle thinking, the blame, twisting of stories to be about him, my fault, i did not remember right…. then there was the event of the grenade to blow me and the baby up. to hold us hostage with threats, then there was the dog going after him, thank God the dog realized he was not right, there was running thru the alley with the baby and Blue the dog, the police with guns drawn yelling keep running, does he have a weapon…. then the fire department, the bomb squad,the evacuating of the neighbors as they sent the robot in to remove the grenade… now jail, court, treatment and my entrance into the Stockholm syndrome… they are right calling it an invisible web where you have no power to walk away, what friends I still had could not believe that now I was sticking up for him, I defending him… still living together, I went to therapy as I recognized this was not right but had no ability to walk out at that time. i would ask her I need to talk to someone who had been through this, but there was not a support group for hostage grenade victims. All I had was my abuser who could relate and in his narcissistic ways kept me drawn in… I miraculously left 16 months ago, still in therapy, going with no contact, blocking, deleting all his attempts to reach me… its better, there is still the draw to him… but not ever going down the path again. I know too much, been hurt too much, I am free to be all God has given me to be… thanks for the post. The more I read these items the stronger my reserve is to never go back! Wow! We all go through hell because of them! May God bless you and the baby and the dog and your future, my dear! How on earth do we live a normal life after $hi! like this? Who believes us, but others who’ve been thru it? I want you to know that I heard you and understood everything you said, and I have compassion for what you went through and what your present journey is. I have 7 children and have been with my abuser for 12 years, separated this past year but I always keep running back. I hate it, I know that me and my children deserve better but I still miss him, I still love him, I still want him back in out home. I say it’s for the children although they dont really complain much about him not being around unless I bring it up, but it’s really because I cant let go. I had never known much at all about narcissistic behavior until I stumbled upon a Facebook page and everything I was reading sounded so much like my kids father. It was as if someone could.finally.see what I was going through, I wasnt as crazy as I was starting to feel, I wasn’t alone. But where do I go from here??? How can I cut him off for good, how can I turn my life around, how do I be happy again??? My children love his side of the family and I feel closer to them than I do my own sometimes, and most of them dont condone his behavior yet they dont know the true nature of his character they have fallen victim to his ways as well believing that him when he puts all the blame on me. But if I keep in contact with them I will never fully be cut off from him because it will all get back to him. Hiw do I cut off the such a big part of my children’s lives???? “Stockholm Syndrome;” brilliant! I always wondered why I kept going back, but this makes perfect sense. Now that I have a name for it, maybe I can break the cycle and stay gone. Thank you. It helps to explain the 18 years. Bravo!!! For nearly a year I’ve been searching for the answer to why I let her hurt me and push away women who truly just want me for me. Needless to say that my bags are packed and I’m on a mission to be gone before her return. I have made the decision that regardless of her being the mother of my child and knowing her family for over a decade I’m going to remove her from all social media and cut all ties and keep it strictly about our daughter. Despite my training to leave anything at moments notice, she’s my cryptonite. One conversation and I’m putty in her hands to wreak the same havoc all over. It’s come to a point that Ive lost all self respect and dignity. I can see that same feeling in other people’s eyes because they know how dumb and stupid I am for putting up with such apparent disrespect and abuse. I really need to establish something that I can be proud of and be the man that my parents raised me to be and the military trained me to see through such deception. Most of all I want my daughter to respect me. Thank you, I never knew why, I’d keep wanting it to work, and spent 28 yrs trying to no avail!! I also got to the point that I had no respect for myself! Thank you so much, God bless you for giving us all this information!!!! THANK YOU!!!! Thank you for your posts. I have learned so much and now know why I keep letting him come back. Now he only stays a day or so. He dont even pretend he cares for me anymore. He is punishing me because I confronted him about his abuse. I used to let him come back but now we haven’t spoken in over a month. He’s blocked on social media and hasn’t tried to call me. At least, not successfully. I have received some calls from random numbers but I usually don’t answer and they don’t leave a message. He left me homeless. He made me move out of the place I was renting and wanted me to move in with him. Then we fought and he told me it was over and I couldn’t move in with him. He racked up multiple parking tickets in my car. Now I have to pay for them. He refused to pay his phone bill once we broke up and I turned off his phone the day that he was traveling across country. I wanted to inconvenience him since this phone bill will cost me $1600 over the course of the next 13 months. He tried to isolate me from my family. And was kind of successful. He never wanted me to see my friends and would freak out if I tried to get a ride home with a coworker instead of waiting for him to pick me up. He always blamed me for being crazy and too emotional. He would straight up lie about how things happened, even if I experienced the same moment with him. He never wanted to trust me and always asked if I was cheating on him. Probably because he was cheating on me but I never found out that he was. Now I cannot trust people because this is my 3rd relationship with a narcissist in a row. The first one was a cheater and gave me a STI. I broke up with him after that. He had no remorse. I thought it was his bipolar disorder that caused him to act so irrationally. The second one used tactics of love bombing, manipulation, lying and name calling. Eventually it turned physical and I broke up with him. I had to change my phone number because he wouldn’t stop calling me even though I blocked him. He would install a second phone number on his phone and text me and call me repeatedly from a blocked number. One night I had to turn my phone off because he called 63 Times. He still calls my work asking for me and when I’m working but the receptionist knows not to let him talk to me and she can’t tell him when I’m working. The third narcissist is the one I spoke of at length. I am in the middle of leaving my narc, I paid for my share of the bills and tried to talk to him but never not once did he acknowledge my feelings, he told me he probably should be with someone that he can control..Who says this kind of stuff to your wife, told me that he never fought with anyone like me and that I will always win when I am trying to rationalize the fact that it is not right to swear at me or call me down. Cannot win,nor do I want to anymore, that is not the man I though he was and I am not willing to be shut down with my voice or opinion.. DONE!!! I feel sorry for what his life is going to be like however it is not job to be responsible for him..I am responsible to him not for him…not my job to cater anymore..